Who lobbies for women in combat? Is it with national security… or something else… in mind? This, says Mrs. Donnelly, “is social engineering to achieve a political end in the name of diversity”. . . [but] it is unfair to the women, it’s unfair to the men, it’s problematic for the readiness and efficiency and effectiveness of infantry battalions. Q: Civilized cultures have always trained men to protect and defend women and children. Christian fathers who follow the example set by Jesus mentor sons to be gentlemen and treat girls and women with upmost respect and care. However, the effective utilization of women in combat requires that men put aside such behavior in order to treat a woman like just another man. What kind of culture does this create? A: Even non-Christians note that groups tend to disintegrate and face extinction when societies fail to train their men to protect and defend women. Men on board the Titanic gave their lives for women, not because they were all Christian men, but because Biblical teaching for society had become the “law of the sea.” The titanic chivalry of “women and children [into the lifeboats] first” flows from Ephesians 5:25. There is also the issue of mentoring. When we focus on “it’s my right” or perpetuate the myth that “equal means ‘being the same,’” how are we instructing a younger generation? What is a young man taught to think about women as they endure the rigors of military training side by side? What do boys learn from fathers who intentionally put women in harm’s way? What is the carry-over to life outside the military? If society will not tolerate male aggression toward women in everyday life, is it wise – or necessary – to make an exception in combat? A civilization that wants to thrive does well to think beyond the present to the future. Q: What are the realities of both training and battle conditions? A: We may want to envision pleasant images of skilled women managing high tech equipment, young men and women successfully practicing self-control in close quarters, and enlisted men snapping to the attention of female drill sergeants, but evidence reveals much to the contrary. There are reported increases of sexual abuse, unfaithfulness of spouses, unintended pregnancy, a supposed “need” for easier access to abortion, and deployment of single moms. Jessica Lynch, pulled from her Humvee and taken prisoner in Iraq, was raped and sodomized by her captors (I Am A Soldier, Too; the biography of Jessica Lynch by Rick Bragg). Q: “Equal means ‘being the same’” may sound good, but can we really ignore the differences between male and female anatomy? 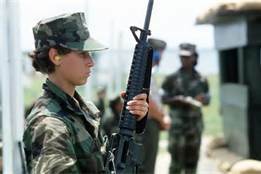 Mrs. Donnelly says, “Women don’t have an equal opportunity to survive in combat.” Why might this be? How might the anatomy of a woman put her more at risk than a man? A: In seeking a bush for privacy, how does a woman avoid sniper fire and landmines? Men can quickly unzip and zip, but is it the same for women? In addition to dignity and modesty, what about hygiene and gynecology? There are drugs that “shut down” a woman’s menstrual cycle, but is this natural and healthy? Feminists and social engineers may deny the differences between men and women, but will the enemy? How might a female prisoner of war be treated differently than a man? If he is obedient to his calling as a defender of women, what lengths might a male soldier go to in protecting a female soldier? Q: Rev. F.A. Hertwig asks, “If there is a threatening noise at the front door, who do you expect should be the first to investigate? Will the man sit back and send his wife, daughter or mother while he goes to the basement?” (“Letters” in The Lutheran Witness, June 2003, p. 4) When Eve stood in harm’s way before Satan, how did Adam respond (Genesis 3:6, 12)? What is the significance of these verses when it comes to the discussion of women in combat? Deborah is held up by many Christians as the Old Testament example of a woman in combat. But, was she? Part 4, the last in this series of posts, will take a closer look at Deborah and Jael. Men, Women and Relationships first published in 1999 and revised in 2004.